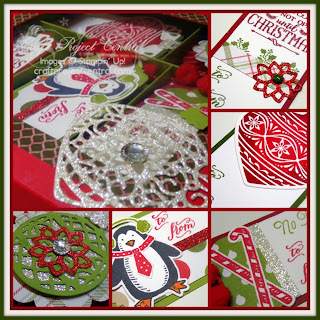 Just Julie B's Stampin' Space: Christmas Tags & Ornament in a Box! Christmas Tags & Ornament in a Box! It’s time to get ready for Christmas! This project would make a wonderful gift, and anyone would love to receive it. While you’re at it, make one for yourself, too. The tutorial includes a decorated box with a window, and has five compartments to hold 20 tags and a Christmas ornament. It also includes four different tag designs, and five are made of each. It includes a little Christmas ornament, too. 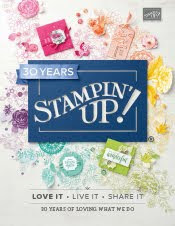 The project features the Snow Place and Embellished Ornament Stamp Sets, along with their coordinating dies. This fun project was made by Christy Fulk, and it's the Bonus Project for the month of October over at Craft Project Central. Bonus projects can be obtained by subscribing to two or more months in a row, putting the Craft Project Central badge on your blog, or by referring a friend and when they subscribe, letting us know. Fry Box Mini Book Set! Masculine Greeting Card Set with Backpack Box! Fry Box Card FIle & Treat Box! Halloween Squash Book with Punch Art!